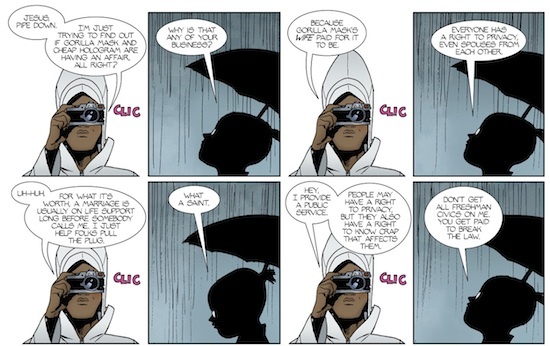 Private Eye #7 – What is the price of complete freedom? There is a world out there that is free from scrutiny and judgement, a place where you are untied from social media chains, but unfortunately it is in the year 2076. The great flood was not a literal genocide to restart the human race, but a system format of everyone’s digital thumbprint, to begin anew, to begin afresh. It plays a gorgeous metaphor that compares the erasure of sins in the eyes of God to the wiping of digital indiscretions to the eyes of people. There may even be a hint of atheistic tones seeping into the premise, where in this current age people are more concerned in hiding their disreputable actions from others than an overseeing deity. In any case it lends to a fantastic setup for a story based around being anonymous leaving you free to just be. The only law enforcement that exists in this world, are those who are expert in tracking information and clues, i.e. the journalists a.k.a. the paparazzi. BKV and Marcos Martin present a world full of colour, deviancy and hedonism set in Los Angeles, after the crash of the ever-present digital age. People very rarely show their true face and creativity is once again yours to behold. Enter P.I. stage left. When a client comes to the door of our protagonist asking for a background check on herself, then there is clearly some mischievous shenanigans at hand. It took little time to realise that her cupboards were not closed securely enough because she was murdered before her skeletons could be returned. Cut to seven issues later and our P.I. Patrick Immelmann or π, is on the hunt with the dead client’s sister to find out why she was so viciously removed from the picture. There are some intriguing panels throughout the issues, revealing a master plan to return society to what it once was, the age of information and observation. Big Brother wants his eye back and it is up to π to stop them. BKV has an uncanny ability to develop real people with real relationships. The characters of this comic are well constructed and have real depth to their personas, avoiding the cliché resource tome. π is a warm and thoughtful character who comes across quite tough and aggressive but there are genuinely caring moments between him and his detective partner, his grandfather who he always loses patience with, and his ex-boyfriend, with whom he shares a very sensual kiss. This is never better demonstrated than the friendship he has with his assistant/getaway driver, Melanie, who is an annoying tubby young woman but risks her life for him. It is almost as if the city, in which they inhabit does not allow them to have the classical societally derived normal relationship. It makes for compelling reading because it is all so far from what we know, except the grandfather. Martin and Vicente’s art just cannot keep itself on the page because it is so vibrant and energetic. His cityscapes are futuristic but almost within the current age of architecture and the rapidly evolving major city landscapes, you could almost say he was ahead of his time. The balance of colour and inking is where the book excels because there are no dull shades at all. Everything is coloured to the height of contrast and luminosity but prevented from garishness and nausea by keeping a reasonable amount of heavy grayscaling. The colours are very complementary especially with interior locations, because green and red walls can easily seem out of place, there is an impressively subtle balance. As much as it is clear he adores the variety and diversity of fashion and masks, he doesn’t let his attention waver from the faces of his characters. Each is instantly recognisable and he concentrates on key features such as π freckles and Melanie’s judgemental eyes. 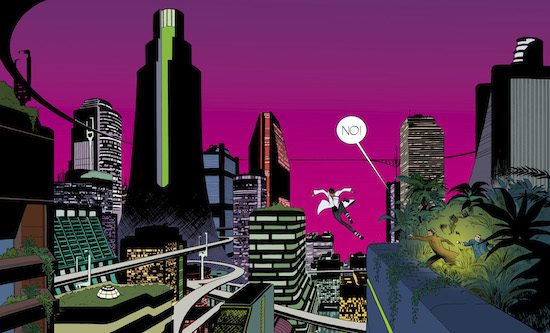 Given that this comic contains twenty-five widescreen landscape pages the story is depicted in a different format. There appears to be less panels a page on average than a paper comic, but this doesn’t detract at all from the storytelling. Martin uses smaller panels when required to deliver a certain emphasis, such as the irritation of Melanie at the onset. However his action sequences are more epic panels that resonate with the page with excellent use of perspective and shattered glass. The car chase sequences use dynamic lines to good effect and smaller panels to give a movie storyboard plan to the page. The result is excellent as we see the sweat and grimace of our hero and villain prior to the big finish. The movement is less appreciable but the impact and tension is glorious. This futuristic world where being invisible allows not only the characters to behave in a completely free manner, but also our creators to write and draw how they please. There is no judgement passed because who are we to judge, and there is no intuitive connection to that kind of society. The only connection we have to this environment is the grandfather who is continually reminiscent of the world in which we currently live. This book is BKV’s commentary on current society and the deeply intrusive social media that exists. Let us be fair, it is not some higher conspiring organisation that is in charge, it is us that drives it. Many of us enjoy the ways in which we interact and find it for the betterment of our lives. 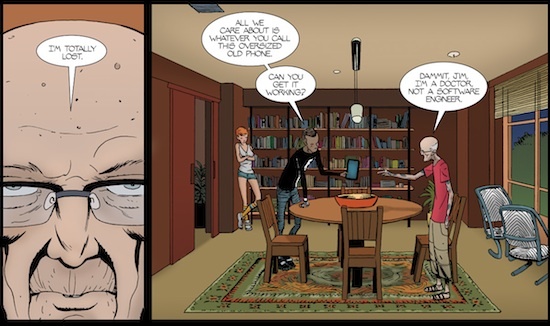 BKV imagines a world where our deepest secrets are revealed to the world, but it is quite a cynical view that we all have sins we would like to bury. As π’s grandfather once said, people are proud of who they are. Theological imagery may enter the fray again if you bring original sin into the argument. We are all sinners and need to be cleansed, hence why the great flood is such a great metaphor. Maybe it is because being free from judgement allows us to truly be who we want to be, away from the constraints of religious dictum or secular society. As the comic very often states, our identities are our most prized commodities. There is an incredibly important part of this comic that needs highlighting: it is free. Well that is not entirely correct because you can have it for free, but the price you pay is up to you. Personally I paid for each comic and the initial issue I actually bought for $5 if I remember correctly and then the usual market price. This is a digital comic produced by Panel Syndicate and the money goes to straight into the pockets of the creators. The letters page goes into detail about how this has actually become a sustainable project, without the publishers, corporations and middlemen. They openly admit that they would probably make more at a mainstream publisher, but page for page they are earning well. This is very reassuring for me because I would be upset if this body of work was impacted upon by financial constraints. It is a very novel approach and I wholeheartedly endorse it, but it does need promotion from the reader to increase its publicity. It will never reach the exposure levels of DC or Marvel but we can all do our best. Ironically it is the benefits of social media that will drive the sales of this comic, one that is intently focused on a world without it. The idea of creative freedom and lack of constraint or interference may be one worth paying for. That is the fundamental theme of the comic and an important aspect of its actual creation. 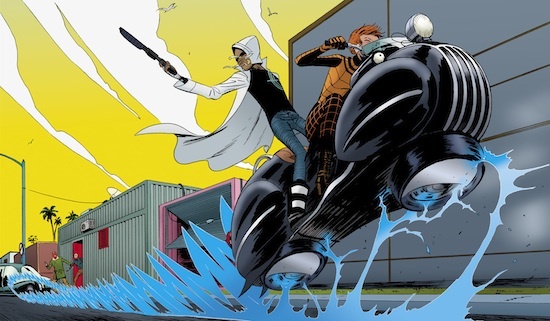 Kudos to Brian K Vaughan, Marcos Martin and Muntsa Vicente for being brave enough to produce this comic and congratulations for its certain continuing success. Please go visit http://panelsyndicate.com and read this glorious piece of part, for whatever price you can afford or deem worthy. Previous PostThe Theatre List 11/6 – 3 months to die? Please, please be true!